AC Steel Rule Dies is our Best in Class Supplier of Steel Rule Dies for Die Cut - Heat Seal Applications. Schwabe StraIght Ram Hydraulic Beam Press, Model SR 230 with 230 US tons of cutting force with electrically heated platen and Infeed and Outfeed pinch roll feed system with pneumatically operated die rails cutting against a Nylon Pad or Hardened ground steel plate. This heated platen comes equipped with separate control panel with four heating zones. Standard feature include programmable dwell time (up to 2 minutes or longer depending on the application requirements). 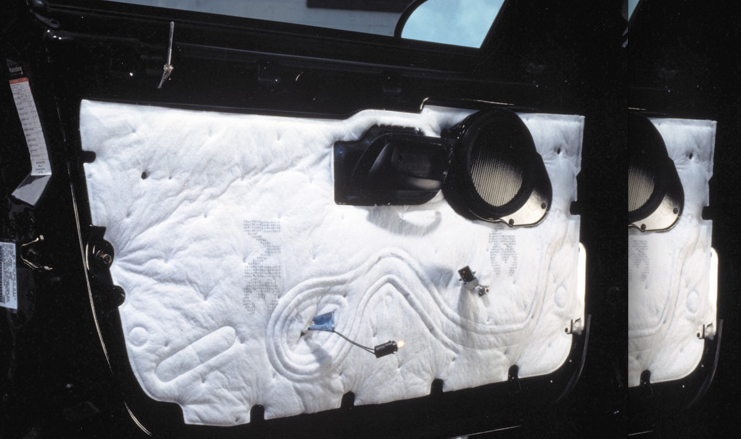 The recipe for each program or job is saved in the HMI for future recall. Programmable tonnage is also an Option. The SCHWABE USA Straight Ram Hydraulic Beam Press can use top heat, bottom heat or both depending upon your application or your customer’s requirement. SCHWABE Hydraulic Presses with heated platen are designed, engineered & assembled in Cincinnati, Ohio USA to meet the needs of your die cut heat seal application. Press size, tonnage, cycle parameters, dwell time, heat specifications and the level of control software sophistication are all designed to maximize your manufacturing process. 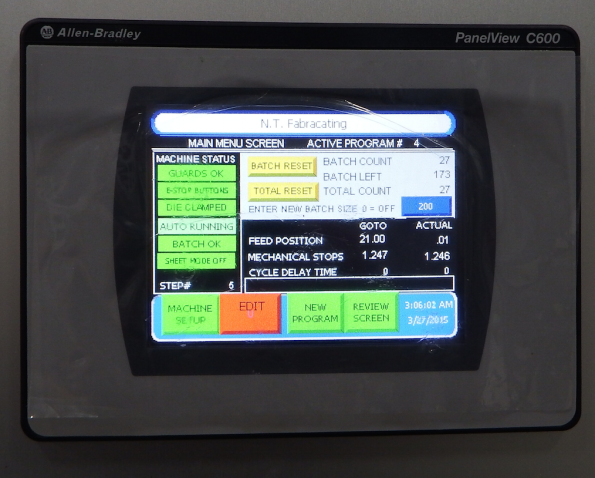 Software control options feature programmable cycle parameters, job/program storage and recipe handling capability. Up to 250 individual recipes can be stored with our standard control package. 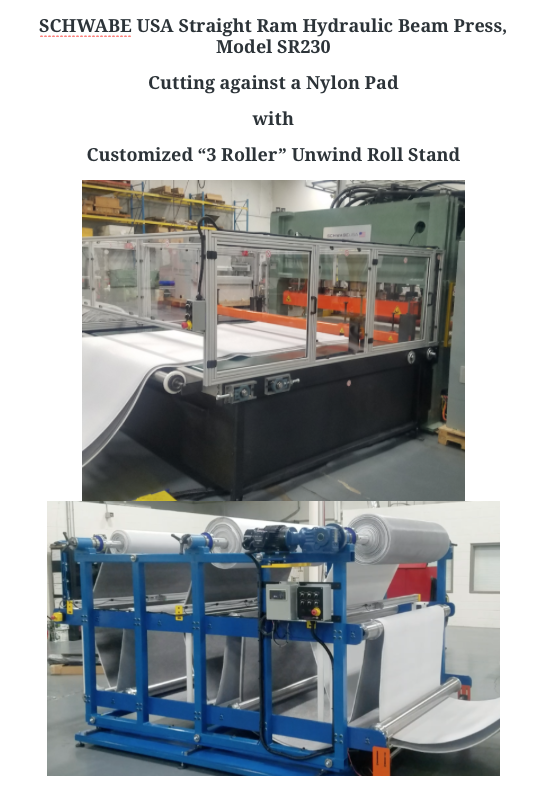 With electric heated platen option added the Model DG 35 tons with power table, is able to die cut & kiss-cut crease heat seal applications as well as molding & trimming, laminating and embossing. 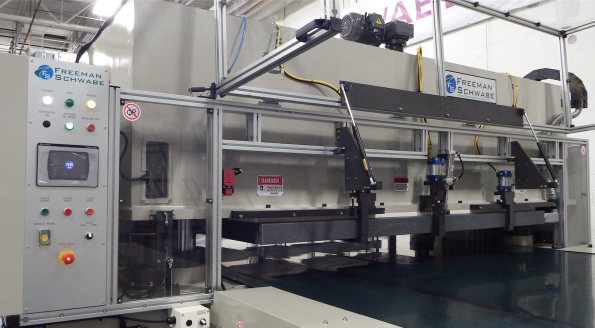 The price of the SCHWABE Model DG 35 (manual table) with heated platen option, starts at $65,000. 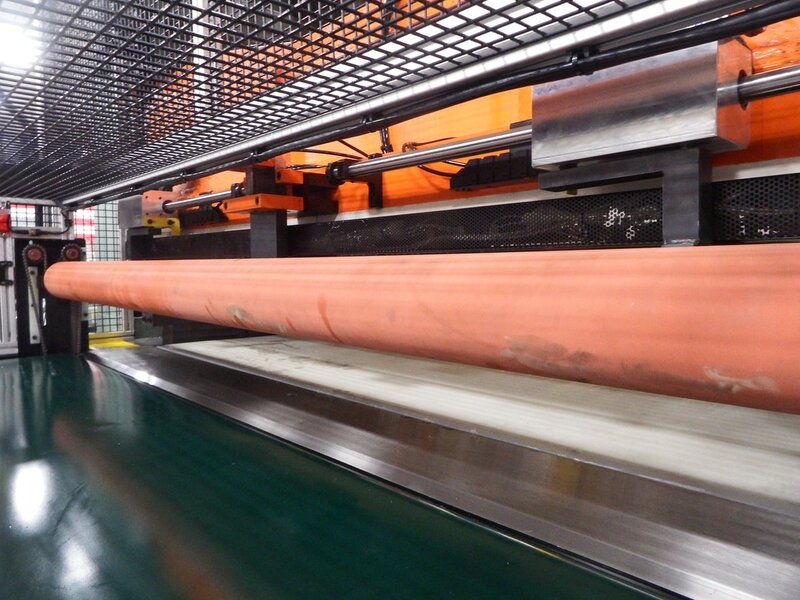 Rebuild/Remanufacture your existing Press with electrically heated platens. Freeman SCHWABE Hydraulic Beam Presses equipped with a Heated Platen are designed and adapted to meet the needs of your application. 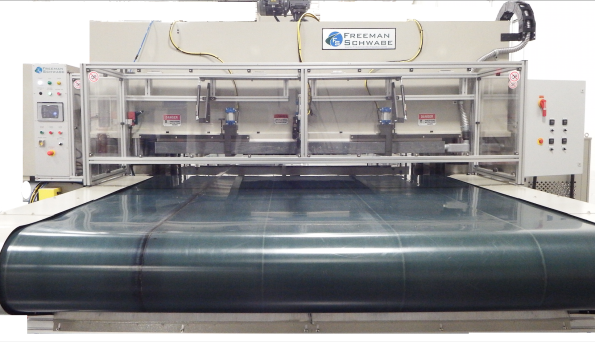 Example of a Freeman Schwabe Full Head Press Heat Platen example of machine delivered April 2015. Allen Bradley Control box and heated platen on a Freeman SCHWABE Hydraulic Beam Press. Freeman Schwabe Hydraulic Beam Presses with a Heated Platen have an operating temperature up to 550 degrees F/287 degrees C and includes multiple heating zones. 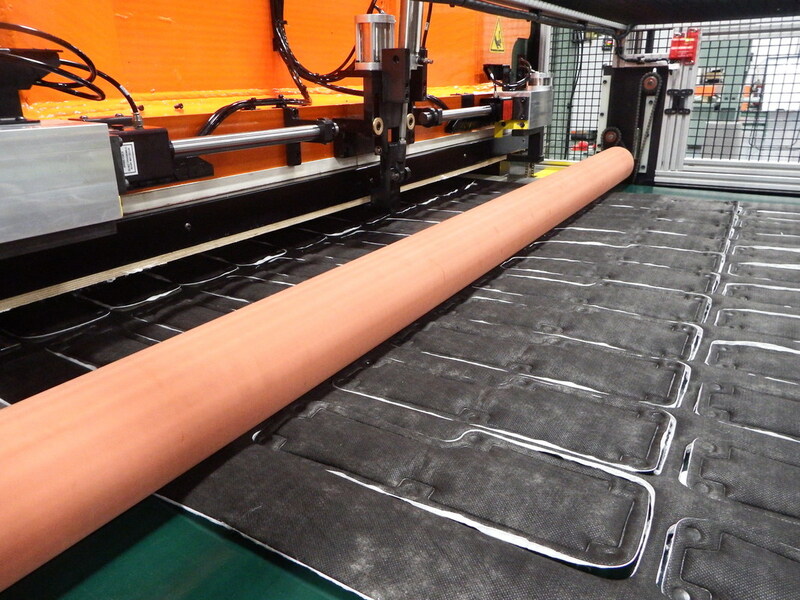 The Heated Platens are generally electrically controlled, but also could be controlled with thermal oil. Usually this is client specific or based upon application requirements. Features include separate control platen and in addition to temperature, dwell and pressure are programmable with parameters saved in the PLC for future recipe recall. – store up to 250 recipes with the standard control package.